We welcome families with children of all ages to join us out on the water for some fishing fun! Our captains will ensure everyone is catching fish and having a good time, giving your family great memories to cherish and share for years to come! Few things are as enjoyable as watching your little ones discover something new and exciting for the first time. What could be a more exciting discovery than the vast world of saltwater fishing? Let us help bring out the inner fisherman in your entire family this year and catch some some creatures out on the ocean! Just Cast Charters makes safety our number one priority for all passengers on board, especially the little ones! At Just Cast Charters we provide an all-inclusive fishing charters service on sunny Galveston Island! We have locations in Galveston and everywhere between! We have multiple captains, making it easy for you to book a trip at a time that is convenient for you! Our excellent, Galveston fishing guides provide everything you need for your trip, all you have to do is, “Just Cast!” Whether you are looking to hunt sharks, catch some dinner, or venture out into the Gulf, our captains will customize your fishing experience to match your expectations and desires! 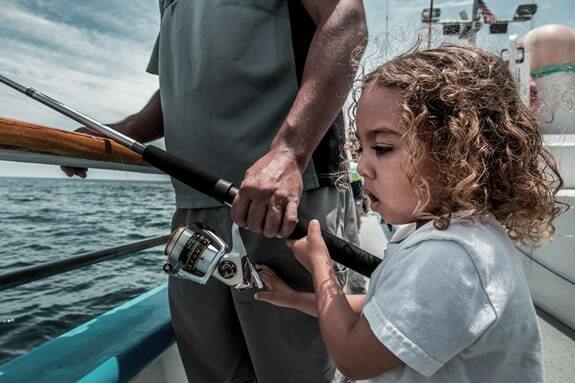 Just Cast Charters is a family friendly charting company that focuses on keeping every charter exciting for the newest to most experiences anglers! Get your crew together and give us a call today so we can start planning a fishing trip you and your family and friends will remember for years! Whenever you are in the Galveston area and you are looking for the most exciting, all-inclusive fishing charter service, choose Just Cast Charters! We make it easier than ever for you and your friends and family to get out on the water and catch some fish! You show up and “Just Cast!” Contact us today to plan your next adventure!